This term Lake Washington Girls Middle School has been offering a robotics and programming club – FuerzaBots! Guided by Ms. Rooks, Ms. Cristina, and Rob McCann P'14, the FuerzaBots team has been busy preparing for the FIRST (For the Inspiration and Recognition of Science and Technology) Lego League (FLL) Robotics Challenge. Each year, FIRST releases a new challenge that engages teams in hands-on robotics design and scientific research. The theme for the challenge is different each year, allowing teams to learn about a variety of subjects. This year, teams will apply research and robotics to explore natural disasters with FLL "Nature's Fury" challenge. 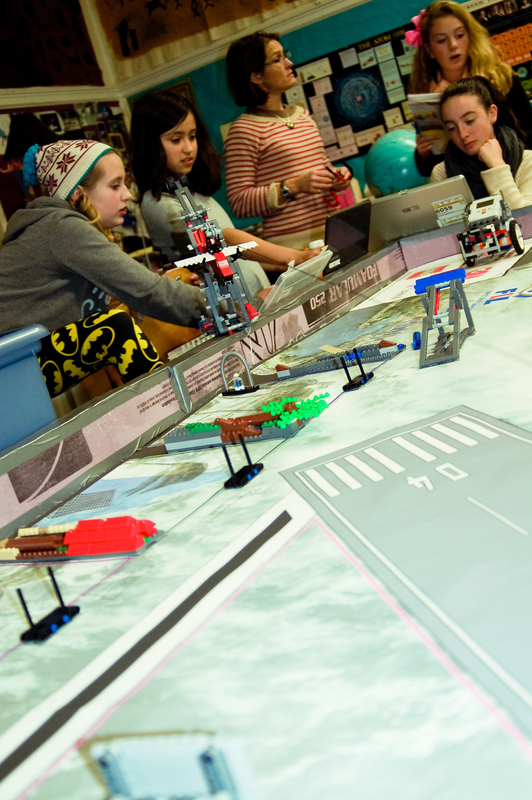 To successfully complete the challenge, teams of young people must build and program a Lego Mindstorms robot to complete missions on a thematic playing surface and conduct research to discover what can be done when intense natural events meet the places people live, work, and play. This is Lake Washington Girls Middle School's first year participating in the event. The FuerzaBots, comprising sixth grade students Eva, Ula, Julia, Maya, and Lucy, seventh grade students Paisley, Hava, Jayla, and Mackenzie, and eighth grade students Rae, Alma, Sadie, Helen, Josephine, and Savita, have been tackling this year's Challenge as a unit. 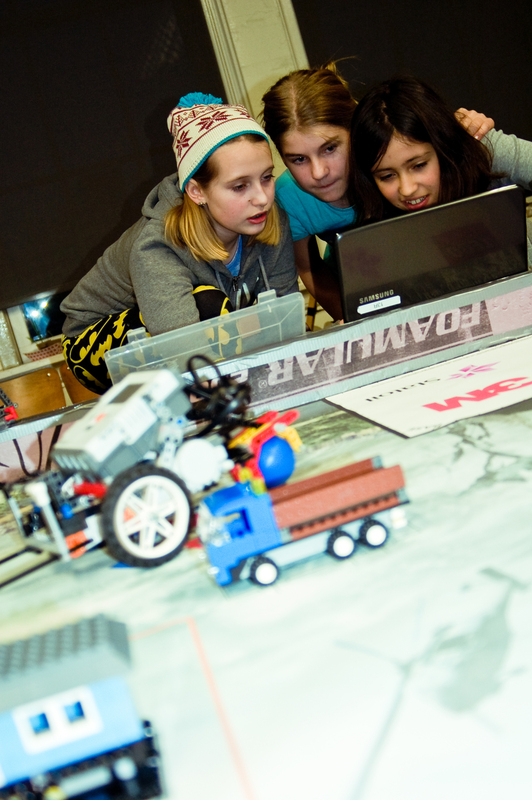 Each Challenge has three parts: the Robot Game, the Project, and the FLL Core Values. Teams of up to ten kids (on the competition floor), with one adult coach, participate in the Challenge by programming an autonomous robot to score points on a themed playing field (Robot Game) and developing a solution to a problem they have identified (Project), all guided by FLL's Core Values – that friendly competition and mutual gain are not separate goals, and that helping one another is the foundation of teamwork. The theme for this year’s competition is Disaster Relief: Nature's Fury. For the "project" part of the challenge, teams were tasked to develop an innovative solution to help people prepare, stay safe, or rebuild after a natural disaster. The FuerzaBots – using the process of Design Thinking – created an app that will help people find and gather an emergency supply kit closest to them (utilizing geo-location), instruct the user how to operate the kit's contents, and offer information on how to best handle the emergency situation at hand – in their case, a volcanic eruption. The FuerzaBots are preparing a presentation of their app to share with the judges at this weekend's tournament. The FuerzaBots have also been working diligently on the Robot Challenge for which, over three months, they designed, built, and programmed four robots, one of which will tackle as many obstacles of natural disaster aftermath as possible in 2.5 minutes. The FuerzaBots dove into programming the "brick" – the brains – of the robot, and they quickly learned how the sensors work and in what situations they would be used. They also mastered how the motors work to make the robot go forward, backward, and to turn, as well as how to make the robots pick items up and move levers. As of today the FuerzaBot's robots can complete six of the ten course obstacles. The FIRST Lego League (FLL) Robotics Regional Tournament is this Sunday, December 8, at Ballard High School. During the tournament, teams have three rounds on the competition tables to get the best score possible. When not competing with their robots, teams give their research presentations, and are interviewed about the technical design of their robots and how they work as teams. Regional qualifiers may advance to the championship event in January. The winners of the Champion's Award, the most prestigious award, may be eligible to participate in a variety of post-season tournament opportunities both domestic and abroad. Our FuerzaBots, whose motto is "Code Like a Girl," are excited to be participating in the tournament for the first time and will be focusing on getting as far as they can and learning from the mistakes they make along the way.